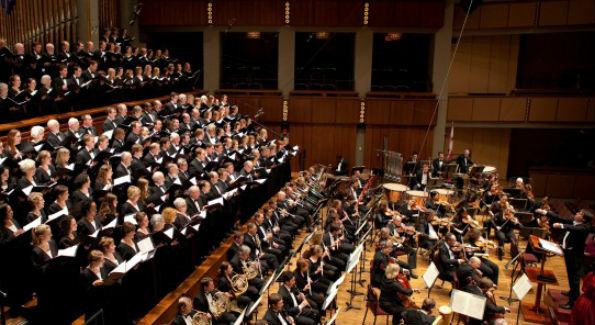 The Washington Chorus’ large-scale ‘War Requiem’ concert left audience frozen with emotion. To celebrate the 100th anniversary of Benjamin Britten’s birth, The Washington Chorus performed his mammoth choral work, ‘War Requiem,’ and to top it off the concert was held on All Saint’s Sunday, a day to honor the memories of the dead. Ironically, Britten’s setting of the mass is non-liturgical with Latin text juxtaposed with poems by Wilfred Owen. Many in the area may remember that the chorus won a Grammy award for their recording of this very work under the direction of former conductor Robert Shafer. Music director Julian Wachner led the chorus, soloists, orchestra and the Children’s Chorus of Washington in a performance so moving that the audience seemed frozen with emotion. It is easy to attend a large-scale concert like this and get caught up in the mere element of music making. However, it would be a great disservice to miss the sense of social responsibility that was emoted through the fervor and intensity of the performance. The opening choral pleas of ‘Requiem’ in unison by the choir, punctuated by orchestral bells, channeled the sacredness of the cathedral and transported the listener to a place of reflection. From the onset, Wachner used his full complement of musicians to his advantage. Every gesture, whether indicating dynamics or articulation, joined the voices and instruments in a musical vignette that was emotionally poignant, highlighted especially by the seamless vocal entrances of the children’s choir in the ‘Te decet hymnus.’ The clear, pristine singing of the children evoked a sense of innocence, and perhaps helplessness experienced during World War II. In the ‘Dies Irae,’ the brass and strings accompaniment gave a rhythmic accent to the chorus of resonant male voices on display. Likewise, the women’s voices swelled with the basses and tenors, further heightened by the percussion and muted brass. Left spellbound by the emotional weight of the massive choral work, there was a deafening silence in the hall followed by euphoric applause. Recently named among the Forty Under 40 for his contributions to arts and humanities, Patrick D. McCoy received a B.M. in vocal performance from Virginia State University and a M.M. in church music from the Shenandoah Conservatory in Winchester, Va. He has contributed arts and culture pieces to CBS Washington, The Afro-American Newspaper and the newly published book, “In Spite of the Drawbacks” (Association of Black Women Historians), which includes his chapter on legendary soprano Leontyne Price. McCoy has interviewed some of the most acclaimed artists of our time, including Renée Fleming, Joshua Bell, Martina Arroyo Denyce Graves, Eric Owens, Norman Scribner, Julian Wachner, Christine Brewer and Lawrence Brownlee. He serves as music director at Trinity Episcopal Church, DC. Listen to these interviews and others at Blog Talk Radio. McCoy may be reached via email at wlperformingarts@aol.com and on Twitter @PatrickDMcCoy.